Scratch-made food that's Fresh. Fun. Fabulous. Celebrating eleven years of bringing you delicious food using organic and locally sourced ingredients. Full service catering for special events, meetings, weddings, box lunches and Dining Delivered. Sweet Dungeness crab, juicy watermelon, cool cucumbers and a zingy lime dressing. Indulge! Delicate scallops poached in white wine, spring fresh minted peas in a natural scallop shell. Pure elegance. Dressed to impress. Creamy new potatoes with sour cream and caviar. Gorgeous petite dessert. Rich chocolate mousse in dark Belgian chocolate cup dusted with pure 24k gold. Breakfast, Bruch or dessert. Delicate puff pastry and sweet apples create an elegant rose shaped pastry. It’s Portland after all! Fresh asparagus wrapped with imported prosciutto, served on a bed of bright tangy lemons. Elegant, full of flavor! Great for your next cocktail event. 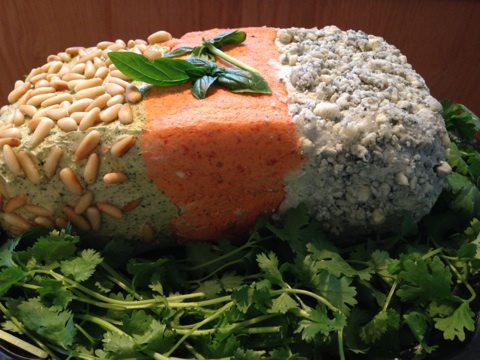 Savory chicken terrine with toasted Oregon hazelnuts, accompanied by baguette or crackers. 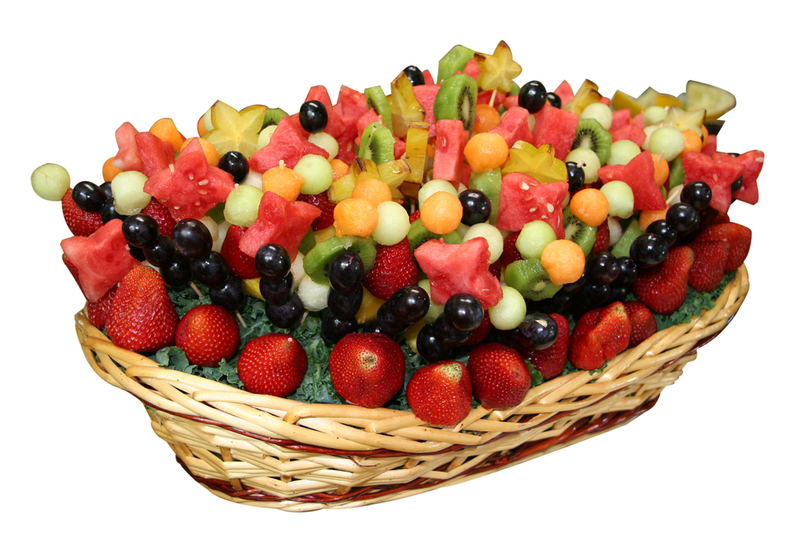 Luscious and luxurious way to start your dining or party. 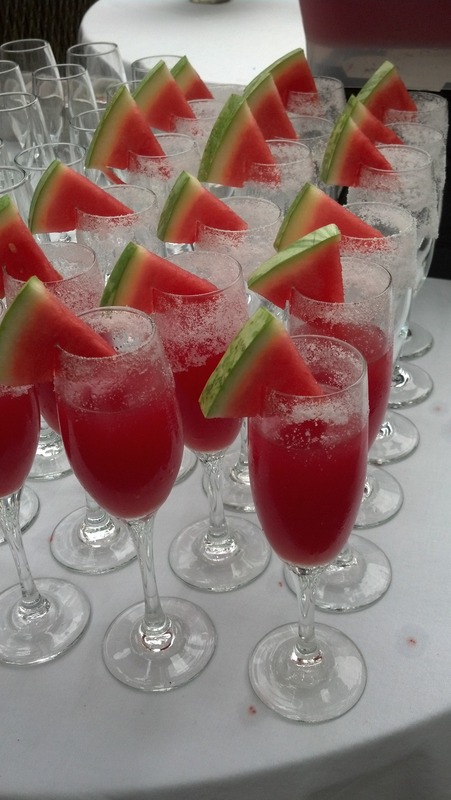 Summer party perfection! Made with fresh watermelon juice and silver tequila these are refreshing as they are picture perfect. Selection of imported and domestic cheeses, fresh fruit and accompanied by baguette or crackers. Perfect party starter. Dinner party elegance. Rosemary roasted lamb with our mushroom stuffing. Simply delicious. Sauvie Island peaches in a buttery cobbler, topped with vanilla ice cream. Delicately crafted pate choux and rich vanilla cream in an elegant presentation to enhance your brunch, Mother’s Day gathering, wedding, or baby shower. 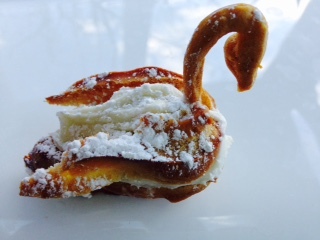 We love these at high tea following the Nutcracker ballet. Crisp vegetables in a savory Asian dressing, wrapped in rice paper. Healthy, light and lovely. Creamy, rich and flavorful. Great for wine tastings and as a party appetizer. Choose from dark chocolate, lemon poppyseed, carrot cake, extreme lemon, traditional English fruitcake, or Madagascar vanilla with a variety of fillings and icing. 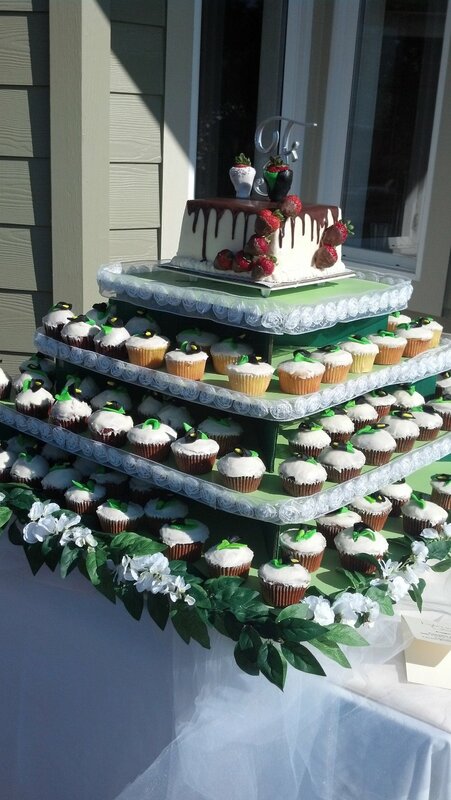 Weddings or parties, cupcakes are fun. Paired with a Bride and Groom. These feature black lilies and strawberries in fondant “dress’ that is modeled after the bride and groom’s attire. Hand crafted marshmallows with brilliant colors. Mother’s day, showers, or to make a winter cocoa even better. Tender chicken breast, fresh sweet peppers. Hearty yet light appetizer. Holidays or any day when you’ve got a crowd. Tangy-sweet dried apricots dipped in creamy white chocolate and dark Belgian chocolate. 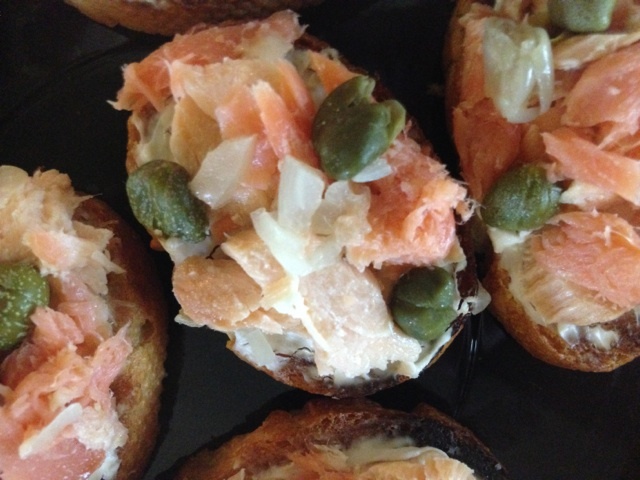 Perfect duo of smoked salmon and wine-poached salmon with capers. Edible works of art. Several sizes of baskets available. Fresh fruit made even more beautiful and perfectly portable. Sweet petite tomatoes filled with creamy bleu cheese or herbed chèvre beautifully displayed as a bouquet of tulips. Happy Spring! Savory sweet bites of luscious bleu cheese and deeply caramelized onion. Wine’s best friend. Generous portion of wild caught NW salmon atop a crisp fresh salad. No more boring lunches! Extra chocolatey, with decadent cream cheese icing. 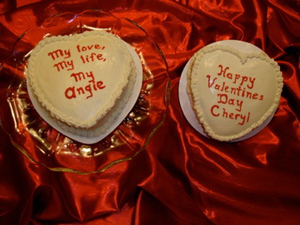 Make your Valentine Day delicious. Tender chicken breast in a savory breading with sweet grapes. Chef’s favorite! Favorite potato skin fillings on a roasted potato round - no forks and no mess! 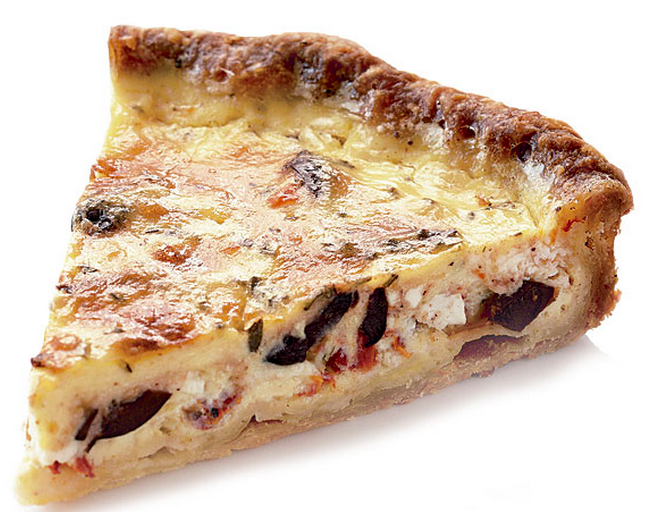 Two inch deep dish quiche in a variety of delicious flavors. Great for a business breakfast or your next family brunch. 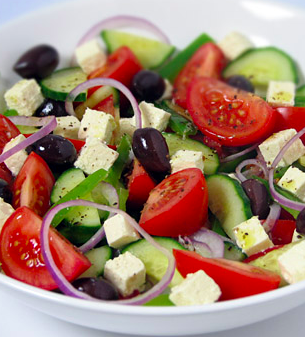 Tangy feta, fresh cucumbers, tomatoes and red onions in a delicious dressing. Almost Paris. Tender chunks of chicken breast, sweet crisp grapes, lettuce, red onion in a light tarragon mayonnaise on a brioche. Scratch made tangy-sweet lemon curd topped with organic, locally-sourced Sauvie island Blueberries. 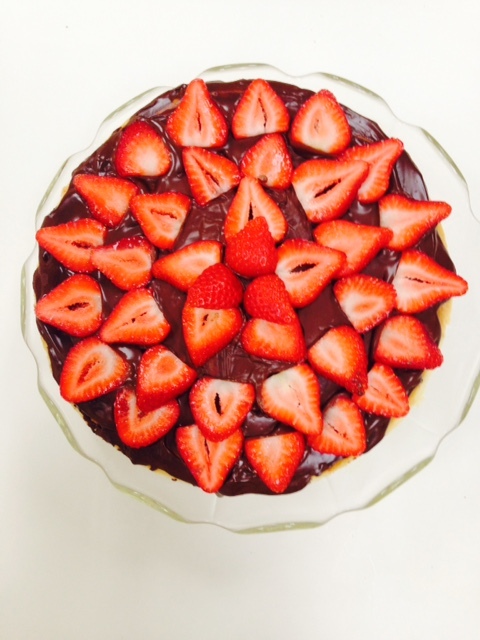 Perfect light dessert! Spicy firecracker prawns on a bed of tangy lemons. Simply elegant. Get the party started! Fresh made cool gazpacho with gold tequila in a shot glass. Elegant. Refined. Deliciously different. Buttery shortbread cookie with organic lavender. Our stylish version of a bombe au chocolate. Triple chocolate cake topped with rich chocolate mousse covered with dark chocolate ganache and garnished with edible silver, opal and gold glitter. It’s just as gorgeous inside! Layers of triple chocolate cake, chocolate mousse, chocolate ganache. Smoked salmon and salmon mousse Vol Au Vents. Classic chic for your next amazing cocktail party. Creative, experienced full-service catering for special events, corporate dining, weddings, fundraising events, and personal chef services. The Exuberance Difference - we use the freshest ingredients, organic and locally sourced whenever possible. We believe that food should be as beautiful as it is delicious. We work with you to create an event that is stylish and unique, we make entertaining easy. Our Commitment: We're as passionate about our community as we are about our food. We're committed to sustainability and contribute a portion of all proceeds to local non-profit organizations in our area. Dining Delivered. Salmon with herbed butter, fingerling potatoes, green beans with toasted hazelnuts. Freshly made dinners delivered to your home or business. We do the shopping, cooking and dishes, you just reheat and enjoy! Comfort food and three-course meals available. We also offer vegetarian, vegan, paleo and gluten free. From $8 per meal. Local and loving it! We're a member of the St. Johns Boosters. Free delivery to homes or businesses in the 97203 and 97217 area. Elevate your event with Exuberance! Elegant buffet receptions from your business clients staff training or arts organization. Make your events easy, elegant and Exuberant. 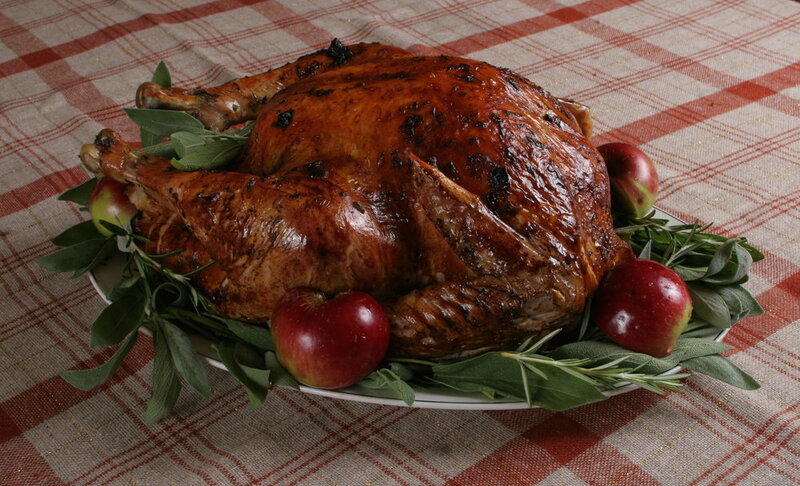 We provide in-home dining, corporate parties, and deliver fabulous dishes to your home or office. Call us at 503-522-0085 to make your event extraordinary. Click on the photos to enjoy a gallery of inspiration. Business receptions are one of our specialties! Call us for a personally designed menu that will make your event Exuberant!